The company made this announcement at the JSConf US Last Call conference in Florida this weekend. Though Chakra is at the core of only Microsoft's Edge, it is used across the Microsoft's newest operating system Windows 10 to power Universal Apps on Xbox, Windows Phone and tablets. 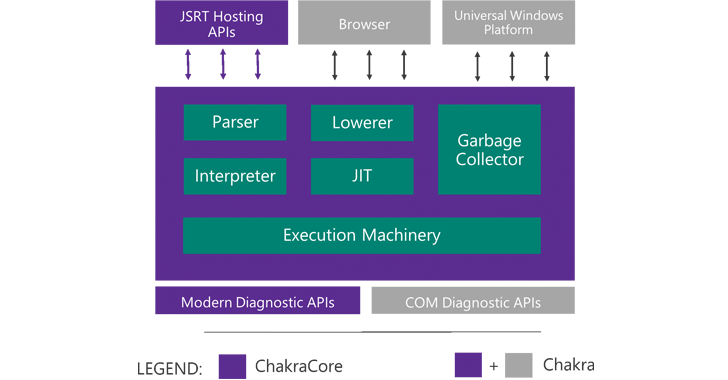 ChakraCore – is what Microsoft is calling the open source version of its Chakra – will be made available on GitHub under an MIT open source license in January 2016, with support from Intel, AMD, and NodeSource. According to the Microsoft's official blog, "We're investing more than ever in improving Chakra and are excited to team up with our community to drive further improvements. In addition to the public [Microsoft means the 'open source community'], several organizations have already expressed interest in contributing to ChakraCore — among many others, we look forward to working with Intel, AMD and NodeSource as we develop this community." Chakra also has diagnostic APIs (Application Program Interfaces) that use COM and hence are Windows-specific. However, neither of the above are part of the open source ChakraCore project. It only contains the 'core packages' for the engine, so doesn't expose Chakra's private bindings to the Edge browser or Universal Applications or make available COM diagnostic APIs. It's an interesting and impressive move from the company like Microsoft that has rarely open sourced its projects. With this move, the company believes ChakraCore will be used in a large number of apps in the future, from cloud services to the Internet of Things (IoT). Isn't that an exciting New Year gift for developers?